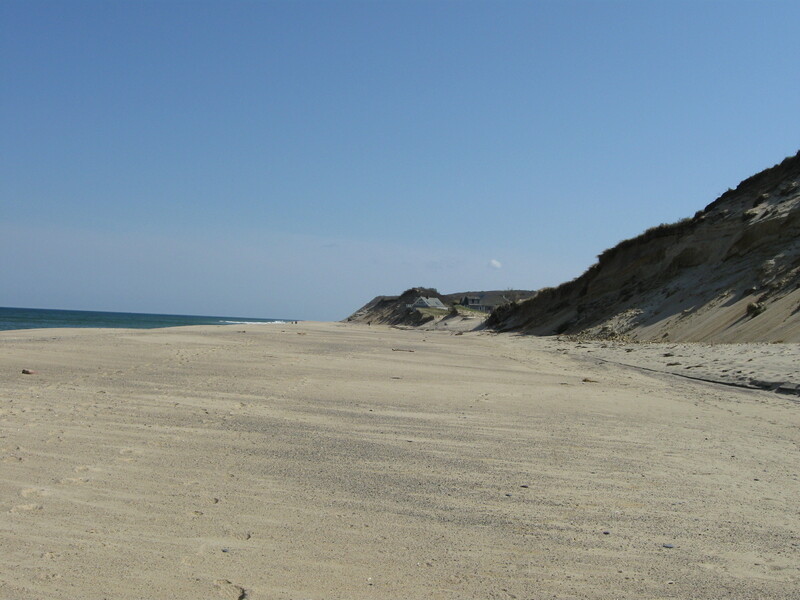 Ocean, beach and sand cliffs on Cape Cod. Cape Cod has become a favorite locale for me and my wife. It was love at first sight when we first ventured there for a vacation in 1998. We like pretty much everything about Cape Cod, but the one aspect above all others is its expansive areas of startling beauty. The Cape’s Atlantic Ocean beach, for one example, is breathtaking, about 30 miles of it uninterrupted and basically undeveloped. In the off-season you can walk there as far as you like, gazing at the waters and the tall sand cliffs backing the beach, and there’s a good chance you’ll cross paths with nary another human. Not many places where such a scenario can be duplicated. And at Cape Cod’s outer reaches is one of the more astonishing vistas I’ve ever seen, a five mile long lunar-like expanse of enormous sand dunes and valleys. Most unusual, most unexpected. Cape Cod’s natural world draws me outdoors. When Capeside my wife and I spend hours in the fresh air daily. Home in the burbs, though, it’s another story. Here I’m out when mowing the lawn or shoveling snow or shooting hoops at my neighborhood playground. Other than that I’m indoors most of the time, and I think this is because there’s a dearth of beautiful suburban places to get lost in. Luckily for me, Philadelphia is at hand. It’s an old city and a new one, with great architecture and sights. Walking its streets and parks is an outdoors activity that I do a fair amount of. On Memorial Day weekend’s Sunday, my wife had an inspired Philadelphia idea. Let’s visit Morris Arboretum, she suggested. We hadn’t been there in years. This would be a fine chance to spend time in a lovely green spot not far from home. Okay, I said. We drove to Philadelphia’s Chestnut Hill section, where the Morris takes up a lot of space (167 acres). We spent three hours there. It was good to be outside for an extended period. Morris Arboretum originally was an estate named Compton, home to siblings John Morris and Lydia Morris. They were wealthy, worldly and civic-minded folks. Their mansion is no longer with us, but Compton’s grounds and some secondary buildings remain. Established in 1887, Compton stayed in Morris hands till 1932, the year of Lydia’s passing (John had died in 1915). Lydia bequeathed Compton to the University of Pennsylvania as a botanical garden and research facility. The U of P has maintained and developed the property ever since. Morris Arboretum has gotten a whole lot better since our previous visit. Back then a parent might have said to his or her five year old Amy or Andy, “Hey, look at that pine tree. Isn’t it beautiful?” and Amy or Andy would have responded “I’m bored, let’s go home.” The arboretum managers, obviously smart people, saw the need to build kid-magnet structures. Up went the Garden Railway in the late 1990s, and in 2009 Out On A Limb opened. Morris Arboretum’s Out On A Limb. Out On A Limb’s play area. Out On A Limb is very cool. It’s an elevated twisting boardwalk, supported by steel columns and threaded between trees on a hilly part of the arboretum’s grounds. You enter at ground level and in a few seconds, because the earth slopes away quickly, you’re looking down 40 or more feet at the forest floor. Walking alongside the mid and upper reaches of trees is a gas. 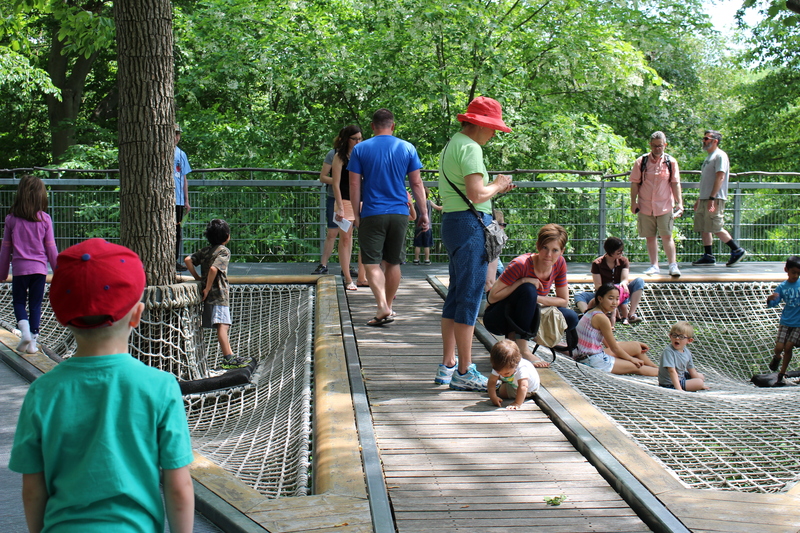 Best yet is the play area at the walkway’s far end, where giant rope hammocks are suspended off to the side. Kids abound there. No wonder that attendance at Morris Arboretum has grown steadily since Out On A Limb came on the scene. Almost as invigorating is the Garden Railway. 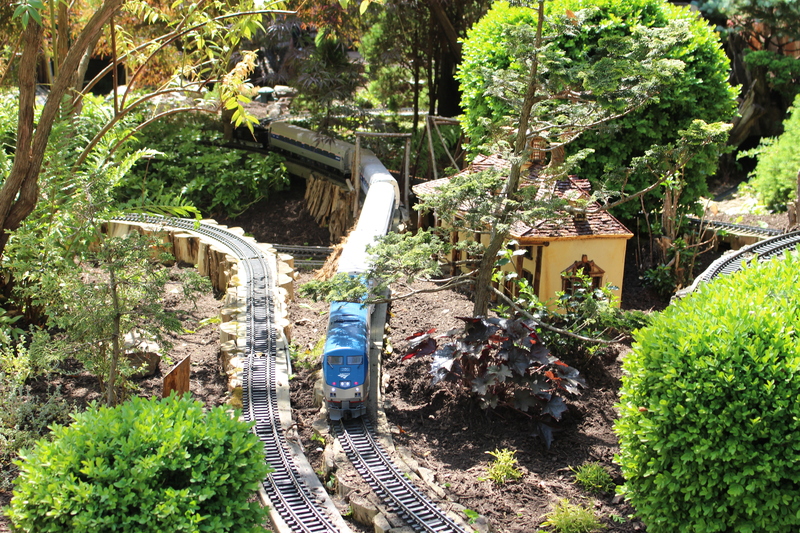 Nestled among trees and shrubbery near the Morris’s Rose Garden, it is a cleverly designed toy train layout. Passenger trains, freight trains, cable cars, tunnels, bridges . . . all are there in three large separate areas. So are natural-material replicas of famous structures, such as the Eiffel Tower and Philadelphia’s City Hall. The trains wind their way over, around and through, disappearing from view, eventually reemerging. My wife and I were intrigued by the whole set-up. It’s something. 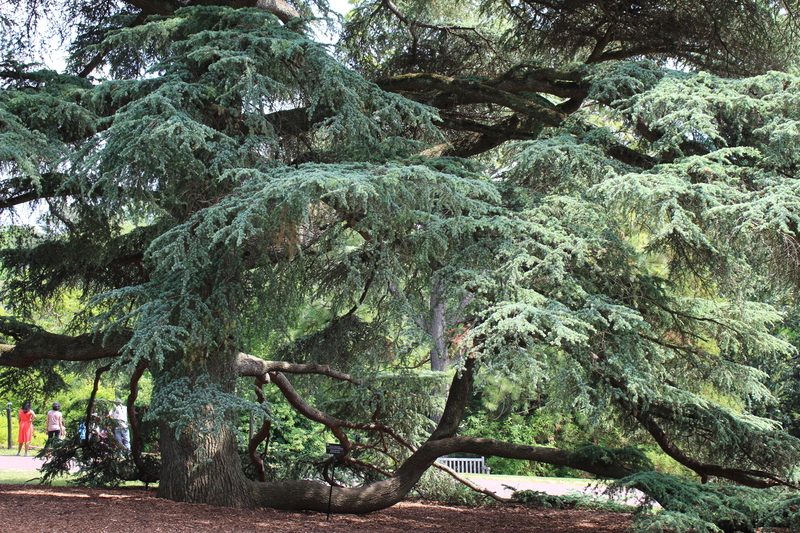 The amazing Blue Atlas Cedar at Morris Arboretum. It’s not a bad idea to stroll the arboretum’s grounds with no particular plan. That is to say, you won’t go wrong by not referring too often to the map you’re given at the information center. Morris Arboretum is a work of art, sculpted to display its trees, flower gardens, fern groves, swan pond and shrubs. Poking around them randomly works. Plenty of things, often green ones, will catch your eye. One tree in particular caught mine, a Blue Atlas Cedar. One of this massive being’s long lower limbs shoots out perpendicularly to the trunk, resting on the earth. The limb I think grows that way naturally. It doesn’t appear to have been forced into its strange position by windstorms or magic. 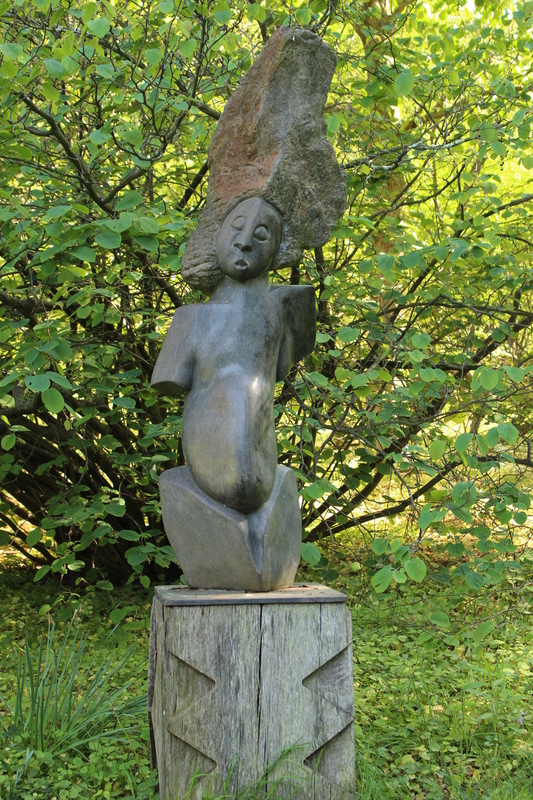 African Queen, a stone sculpture at Morris Arboretum. 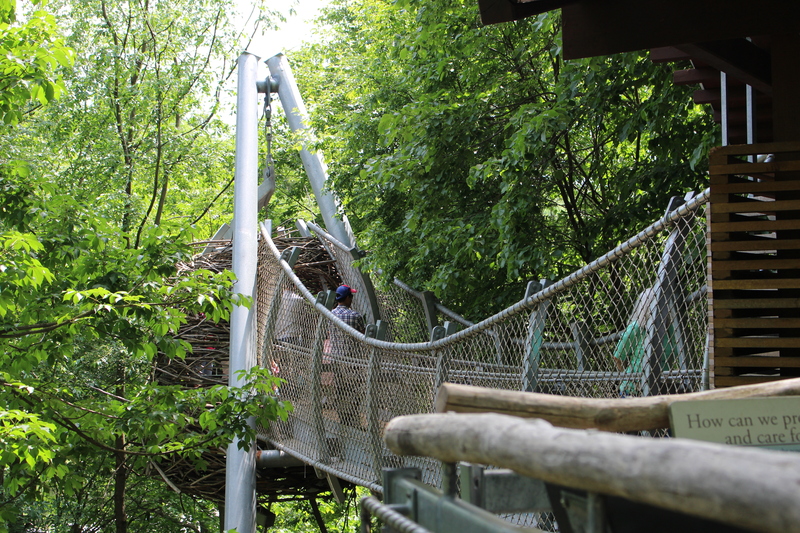 Manmade sculpture is another big part of the arboretum experience. Many such objects are placed on the grounds, continuing a tradition that John and Lydia began. The most colorful are the large playful and organically-shaped painted aluminum creations by the late George Sugarman. They’ve been on site since 1981. The most alluring sculpture to me is African Queen, a stone carving from Zimbabwe, artist unknown. How old is it? 50 years? 500 years? If the arboretum custodians have the answer, they’re not saying. Regardless, it’s a charmer. Pablo Picasso, who was greatly influenced by African art, would have loved it. The armless queen is asleep, her sweet face lost in dreams. The artist chose to depict her headdress as broad and undefined, focusing attention to the face below. 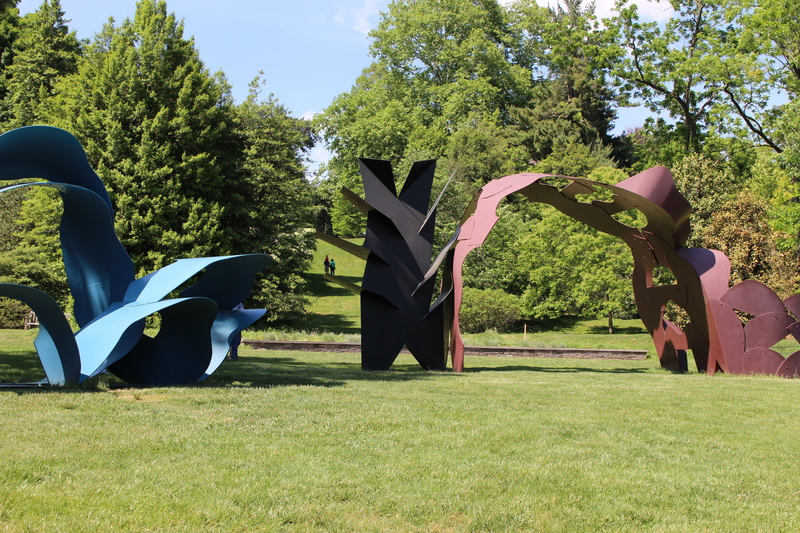 A visit to Morris Arboretum, in my opinion, is incomplete without making time for this superb piece.